We have placed online a first draft output using our in-house software to obtain accurate height/facade data from photographic modelling. 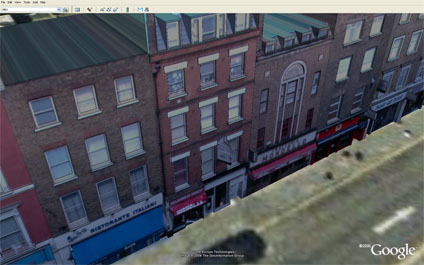 Using a camera calibrated algorithm we can ensure accurate placing of windows/doors etc to rapidly create city models. With the beta version of Google Earth, these can then be easily imported and viewed. The software is currently being developed, if you would like further details please feel free to email. Wow .. great stuff. Shame it bulks the file size up so much .. we’ve been running similar tests and finding some file sizes are huge and unworkable in GE4 .. but hey this is fantastic .. when will you have your movie biiboards working live in GE?? Yes, great stuff here. How about using the new streaming facilities GE 4 claims to be able to implement? Have you had a go at it?